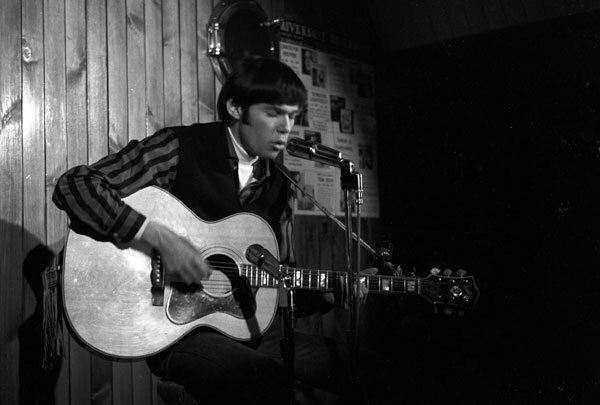 Some vintage Neil Young photos at the Riverboat Coffee House, 1965 Yorkville, Toronto, Ontario by Manfred Buchheit over on Purple Words on a Grey Background. Also, see NYA Question of the Moment: Riverboat Recordings. Someone shoulda sent that to Neil for the Archives Vol. 1. I'm sure he wasn't aware of this photo. And it seems to prove that he played there more than once in 1965 as he's wearing different clothes than the other picture that exists. Rock'n the sideburns - he looks just like his Old Man! And the handsome Ben Young, too!!!! wow...and a Gibson acoustic ! Yay, great photo. Neil was such a handsome young man. LOL asg, I had to take look closer when you said Gibson! Did Neil know any of the Hawks? They were just coming into popularity. Maybe he borrowed it from Rick Danko? Asg, you didn't see the other photos on PurpleWord's blog - the headstock confirms it's a Guild f50... take a looky, bro.